Mighty Girl, #Likeagirl, Smart Girl …this is my daughter Parker! 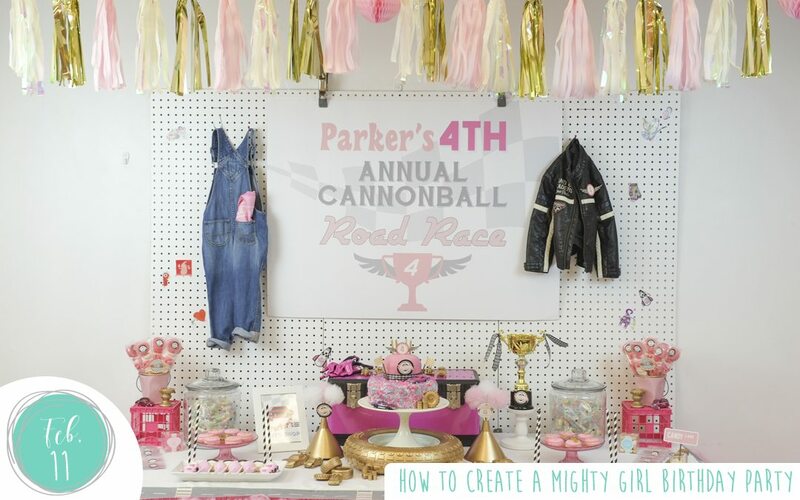 and this post is all about how I created a Mighty Girl party to suit her fierce personality. She is the perfect mix of Princess & Warrior so I knew it wasn’t going to be easy! 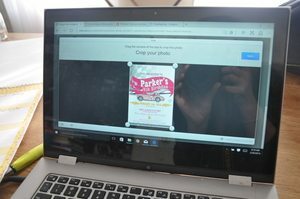 Parker loves cars, like really loves cars, not your traditional 4 year old girls past time. She loves playing with them, racing them and watching them endlessly. In the early days Parker had to borrow cars from her brother Harrison. One of her happiest moments was getting her own set of cars and a track. Each car is named and endearingly most have a mommy, daddy and baby car in the family. This one comment set me to thinking about her requested car theme birthday party. 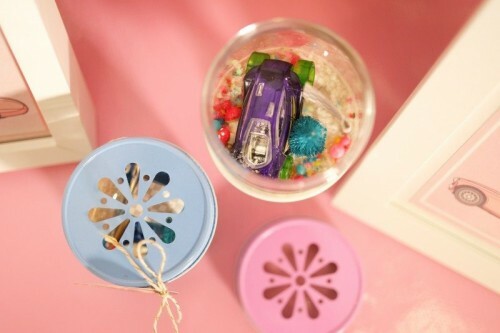 Most car party goods and toys are very traditional colors and quite masculine. 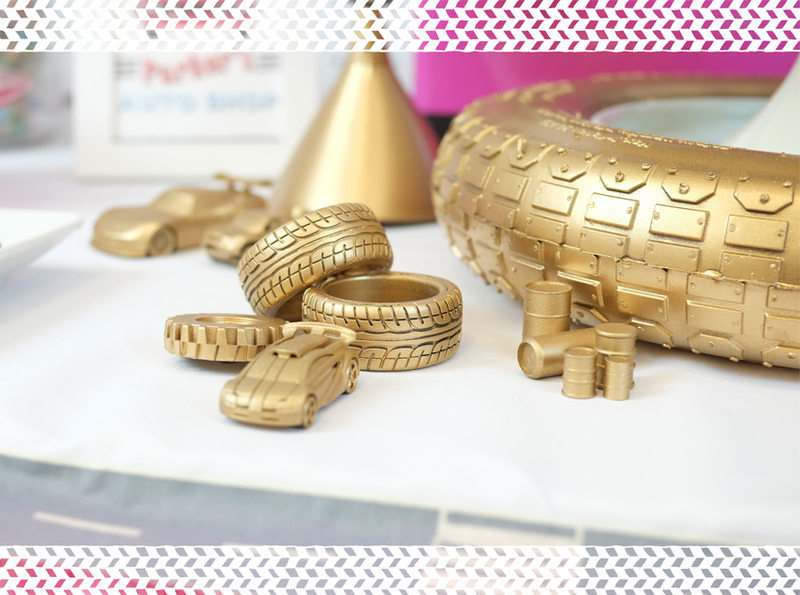 Parker loves pink and gold…why shouldn’t Parker be able to have her car party in the colors she likes, celebrating her femininity and love of pink & gold as well as speed and fast cars at the same time! My mighty girl can have it all! Yikes does this mean I have to be super mom!! arghhh! So first I wanted to firm up a theme that incorporated cars & personality, Parker and her brother both love the old Herbie and cross country road race movies. Yes this comes from us!This inspired me to make this a “cannonball run” theme, using 4th annual to reference her age as well as the cars making their way down route 4. I’m lucky to have Elena at World Wide Party as a friend, I think we can read each others minds sometimes so we had a lot of fun with this one. She created a gorgeous invite for me. We communicate via a pinterest mood board as she is in Dubai and I am here in San Francisco and she captured perfectly Parkers love of vintage cars, pink and hot wheels. She combined all of them into a unique design I adore! 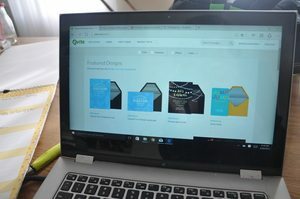 Did you know you can load your unique design into evite now (www.evite.com)! I was so pleased, it was so easy and it meant using my custom themed invite AND being able to manage rsvp’s and questions as well. See the screen below, click and load and then you are even free to edit. So how to start? Spray painting, my addiction. I used 2 coats of Rust-oleum brilliant metal finish gold with a final coat of their glitter shimmer finish and it came out really are golden. 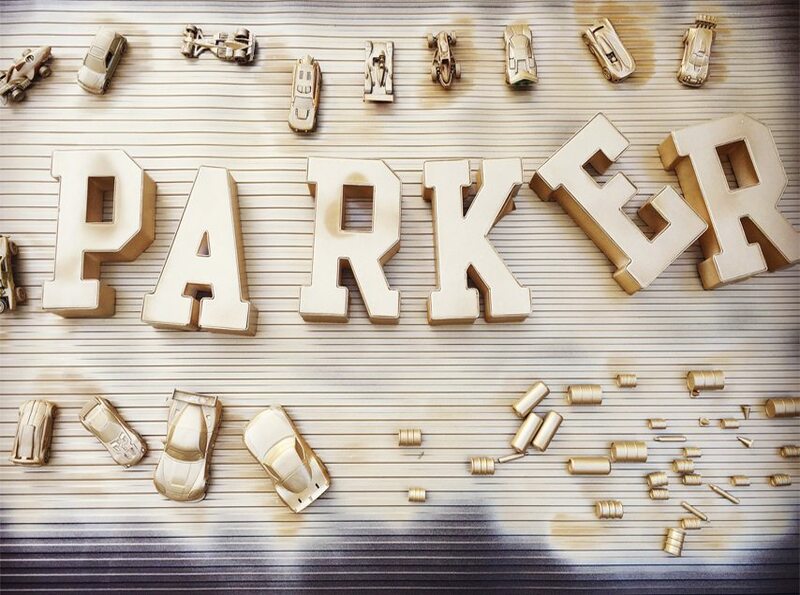 I found large wheelbarrow wheels at the local hardware store, smaller tires and letters to spell “Parker” at Michaels. The cars, I purchased a 50 pack for $22 from Oriental Trading (www.orientaltrading.com) and snuck a few larger ones from the kids (they still don’t know!). Race track pieces for hot wheels cars sprayed well and you can purchase small sets from Target (www.target.com). I laid out a large tarp on the deck and then set to spray painting masculine tires, cars, oil funnels, oil barrels and race tracks gold. You can see my selections, process & final results in the pictures below. Tip: leave the cars in the tray they come in to spray, then turn them over when dry to spray the undersides, this stopped them moving around and gave them a nice even coat. 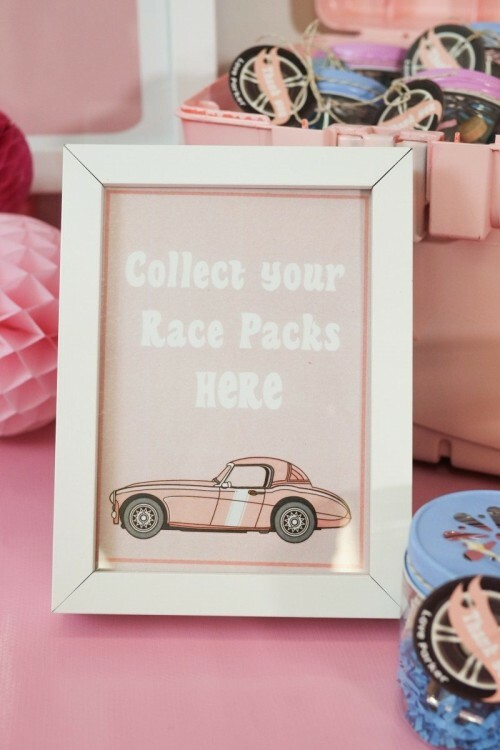 The next step was hunting down other “car” related items in feminine colors. Not such an easy task but I finally found pink tool boxes and other “auto shop” accessories at . I love that tool box so much it has now become my walking craft kit! The racing gear I found on eBay and was for girls motorcross, I purchased a helmet, gloves and racing goggles all for under $35! All of these I planned to combine with a tulle table skirt (I got mine from JP Alexander events, over 700 yards of tulle!) & tissue tassels to create the dessert table and give a good contrast. The dessert table as a feature would be the auto shop, complete with the tools to get her car ready to race. I used a pegboard (available at your local hardware store) as a backdrop. These come in smaller pieces than I needed which became a bit of a stress and I wasn’t quite sure what I was going to do keep them together. Funny how these problems sometimes create a better look and feel overall – I spent 1/2 hour in the hardware store and finally found some super strong auto clamps which held them together really well and worked for the theme. I used the peg board to hang her race jacket and an old pair of denim overalls with a pink rag in the pocket. I also showcased the road rally trophy on this table and her cake which I created, (see my upcoming blog on creating a multi-tier cake using store bought cakes) on top of the giant gold tire I had spray painted. I flanked this with the gold cars and other auto shop details I’d sourced. 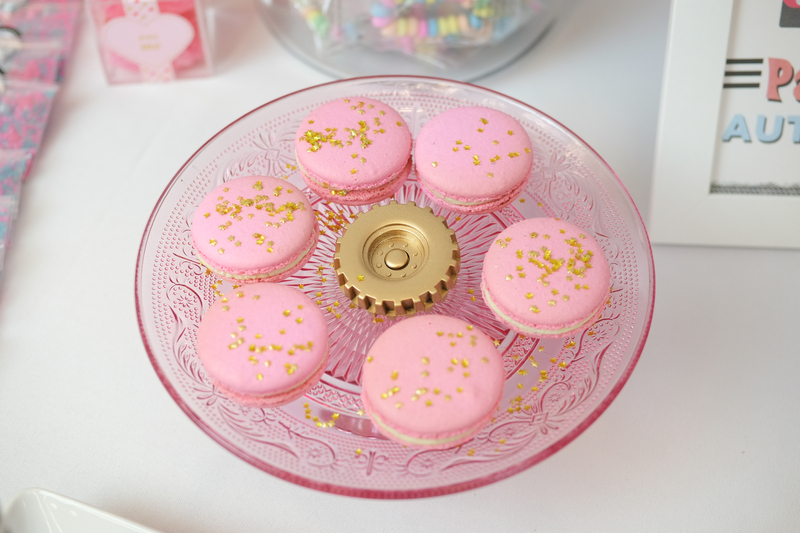 To complete the dessert selection I added store bought macaroons (add gold edible flakes!) and cake pops from “Let them Eat Pops”, these were made into cute finishing flags, cars and pink cake pops for the table that fit perfectly. Also large candy jars filled with candy bracelets (the colors were perfect and the kids love them!) and candy kabobs from “Sweets Indeed” inside little pink crates I found in the dollar spot at Target. I also had mini packets of candeyfetti that “Sweets Indeed” make….this stuff is sooooo good! and Marie custom made the color combination for me. So if you don’t find exactly what you need just ask. I loved it so much I used it on the cake too! 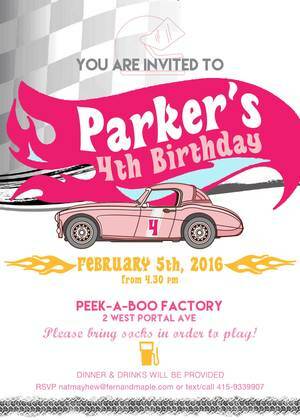 I had a lot of fun using Parker’s favorite sweets throughout this party. 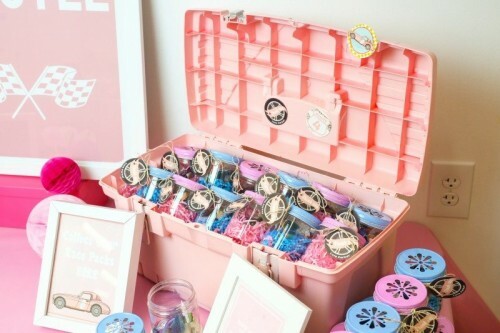 Check out my upcoming blog post on “displaying candy in creative ways” for more DIY details. Candy, to me, made the perfect mid-race pit stop for the kid racers. So I created a Jelly Belly “pit stop”. Jelly Belly’s dispensers look so much like gas pumps so they made great fueling stations at the pit stop (spray painted gold of course! ), their gift cans (already in gold) easily became oil barrels and the jelly belly’s themselves were spare parts. Finally, Sweets Indeed have Candy Kabobs which made great spare tires – these were a huge hit, easily held and nibbled on. I love photo booths! really creates a talking point and a little silliness. So I couldn’t pass up the opportunity to make something fun. I had planned to make a large cardboard cut-out but time constraints (never enough time) led me to the back up plan – buy one, a vintage pink car I purchased via amazon from Star Stills. This became the center piece and I placed a couple of playroom chairs behind it so the kids could pretend to drive (truth be told hubby spent the most time in it!). It was a big hit with kids and adults alike and Parker played the part perfectly in her helmet, gloves and googles, driving her friends, wearing the gear I had left these at her seat of the eating table (in “the lane reserved for Parker”)…she even wore the goggles to blow out the candles on the cake. I used a simple photo booth stand behind it and hung up a couple of frilled curtains I found at Bed Bath & Beyond (on sale…yes!!). 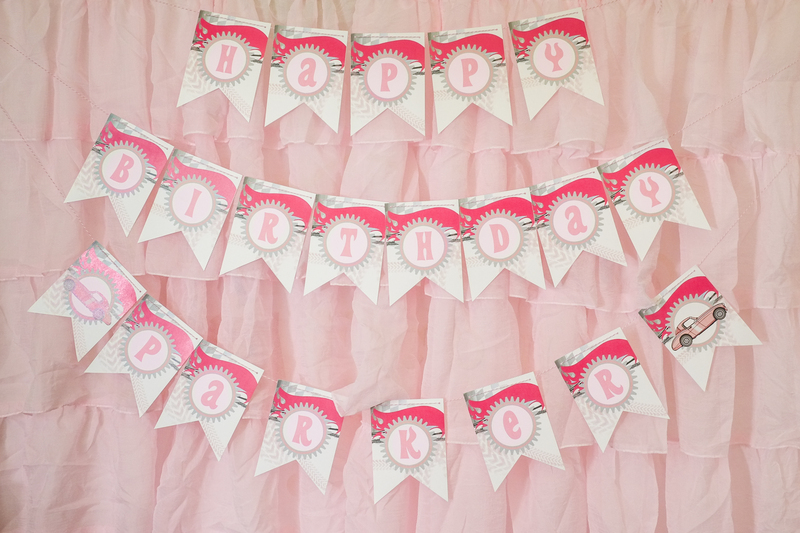 These hung easily and I was able to tie the birthday banner from world wide party on top. A few gold foil tassels and I had a glam photo booth! Right by the photo booth we also had a “Buff & Polish” station where the kids could get their face painted or have a manicure…(it was all the things Parker loves after all) and then pose for a photo! It’s here that I also had Elena create a printable for me that sums up Parker (for me) “Though she be but little, she be fierce”. It sat atop a gold sequin table cover and was clamped with a tool to the photo booth! It gave the booth a little attitude and I managed to get hold of a pink instant polaroid camera, so old school and perfect. While I grew up with these (old lady! ), the kids had never really seen one so it was a lot of fun and meant they could take their photos home as a keepsake. I had been imagining the main eating table in my mind ever since I decided on the theme. A gold race track jammed with gold cars down the middle of the table, cars driving down route 4. Route 4 was lined with tulle pom pom trees (Tiffany at Fizzy Party matched the tulle perfectly to the jelly belly’s I used to hold them up) and road signs, it really kept the kids busy while they were eating, as they drove cars up and down the table. Now we know that’s the main idea. Right at the center of the table I had another large gold tire with signage for route 4. At the end of the table, the “finish line”. I wanted to play at that table! The tableware available now is GREAT! I found plates with scalloped edges, in the right colors, from Paperchase (now available at Target). I topped these with gold scalloped bowls from Meri Meri, I bought mine through Oh Happy Day but they are available from several sources. Finally some gorgeous plastic cutlery in rose gold from Michaels, these were my favorite find and I’ve stocked up on them for other parties. They are so elegant and almost look real. Elena created adorable mini road signs that I used on the table and also for food labelling…for example popcorn row, crudité circle, pepperoni plaza and candy lane. The food itself was standard “kid fare”, pizza, pasta etc but I did add individual servings of fruit and crudité which I’ve found help with the healthy eating…the kids love the mini forks and eating out of a cup. This table also had “P-A-R-K-E-R” in large gold letters and was lined with fantastic cardboard popcorn boxes that look like vintage pink cadillacs. I’ve used the red pick up trucks before for a boys party and they are so cute! I get them from “The Party Fairy” on Etsy. Our little party goers (racers) not only enjoyed the popcorn but driving it around the party room. Hope you enjoyed the party. Here are all the sources you need. Come along to our next party!